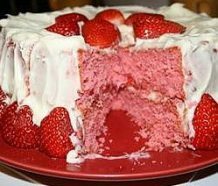 I have more than just a homemade strawberry cake recipe from scratch, check out more easy cake recipes at the end of the page. You'll love this strawberry cake recipe. It produces a cake that is moist, fluffy and delicious; like heaven on a fork. I offer two outstanding strawberry frosting recipes below. PREHEAT oven to 350 degrees. Butter three 8 inch cake pans and dust the inside with flour and tap out excess. Line the bottom of the pans with wax or parchment paper. Put the cake pans on a baking sheet lined with parchment paper or a silicone mat. In two small bowls, separate the egg whites and the yolks. Whip the egg whites into soft peaks; set aside. Measure out 3 or so cups of the cake flour and sift. THEN measure out the 2-3/4 cups of flour needed for this recipe. Set aside. In a mixing bowl, cream together the butter, sugar, and jello until light and fluffy. Add the egg yolks one at a time, mixing well. Combine flour and baking powder; and stir in alternating with the milk. Blend in 1/2 cup of the strawberry puree and vanilla. Now fold in the egg whites. Divide the batter evenly into the cake pans. I raise the cake pans about 8" to 1 foot from the counter and let it drop to remove the air bubbles. Bake for 25 to 30 minutes or until a toothpick inserted into the center of the cake comes out clean. Allow the cakes to cool for 15 minutes and remove from the pans. Place one of the cakes on your cake plate and before putting the other cake on top before frosting; spread the remaining 1/2 cup strawberry puree between the two cakes. Whip the butter and vanilla until light and fluffy. Add the powdered sugar 1 cup at a time; mixing for 1 minute after each addition. Stir in the strawberries. Now it's ready to frost the cake. Slice some strawberries and place on the top of the frosting. Melt some chocolate in the microwave and drizzle over the strawberries. Delish. Beautiful presentation and tastes even better. 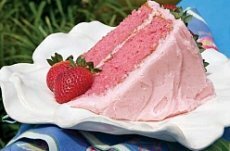 For this homemade strawberry cake recipe, I usually ice the with a fluffy and light frosting. You may use a whipped cream cheese frosting; both work beautifully. I have more cake frosting recipes if you want to take a peek (lemon frosting is another one to try). PREHEAT oven to 350 degrees. Lightly grease two (9-inch) round cake pans. In a large bowl, combine cake mix and gelatin. Add puréed strawberries, eggs, oil, and ¼ cup water; beat at medium speed with a mixer until smooth. Pour into prepared pans. Bake for 20 minutes or until a wooden pick inserted in center comes out clean. Let cool in pans for 10 minutes. Remove from pans, and cool completely on wire racks. Spread Strawberry Cream Cheese Frosting between layers and on top and sides of cake. Garnish with sliced fresh strawberries, if desired. Store cake, covered, in the refrigerator up to 3 days. In a large bowl, beat cream cheese and butter at medium speed with a mixer until creamy. Beat in 1/4 cup strawberry purée; reserve remaining purée for another use. Beat in extract. Gradually add confectioners’ sugar, beating until smooth. I have more than just a homemade strawberry cake recipe. Please check out the homemade recipes below.